IEA SHC || News || Task 39 Handbook is Available Now! Task 39 Handbook is Available Now! 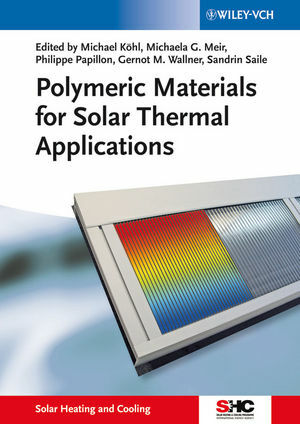 Bridging the gap between basic science and technological applications, this is the first book devoted to polymers for solar thermal applications. Clearly divided into three major parts, the contributions are written by experts on solar thermal applications and polymer scientists alike. The first part explains the fundamentals of solar thermal energy especially for representatives of the plastics industry and researchers. Part two then goes on to provide introductory information on polymeric materials and processing for solar thermal experts. The third part combines both of these fields, discussing the potential of polymeric materials in solar thermal applications, as well as demands on durability, design and building integration. With its emphasis on applications, this monograph is relevant for researchers at universities and developers in commercial labs.